I don’t very often feel the need to detail complaints here. The last time I did this was yodel, so Tui are now part of a special club with Yodel. I do this, so others don’t have to go through this process again, either because they choose to take their business elsewhere, or because TUI actually learn from this, a few weeks on, it seems like they can’t/won’t learn. What follows is a recollection of factual and information from my memory detailed as accurately as I can. This is my own personal opinion based currently on my current situation. Other people may have different views/opinions or better luck. 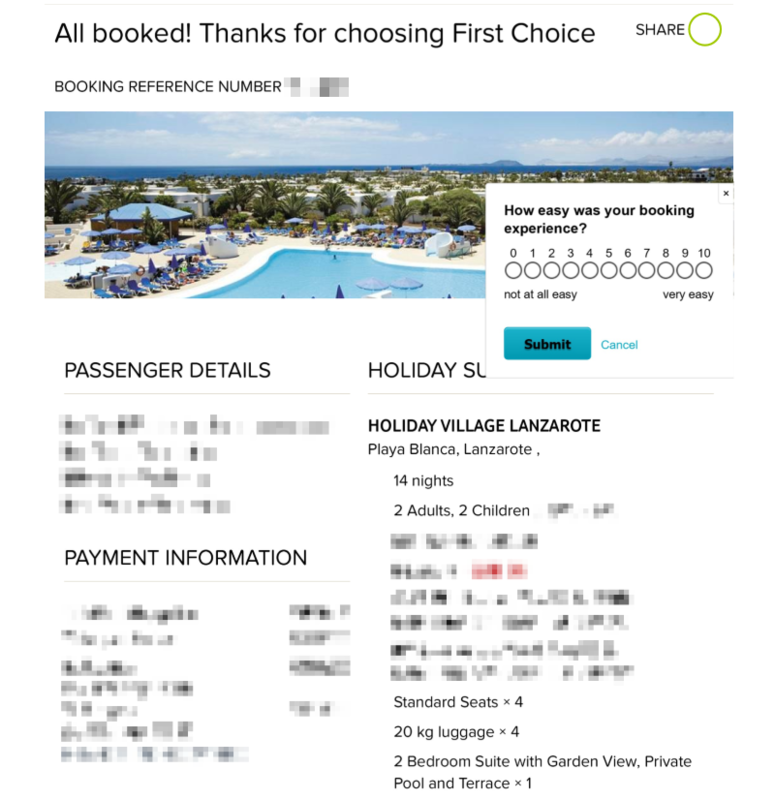 So early morning on Launch day (5th April 2018) we were on the First Choice website (Part of Tui group) to find an all inclusive family holiday with our specification. We narrowed down quickly to two or three, and in the end after much deliberation made our selection, which I printed to a PDF for the reference number and details. 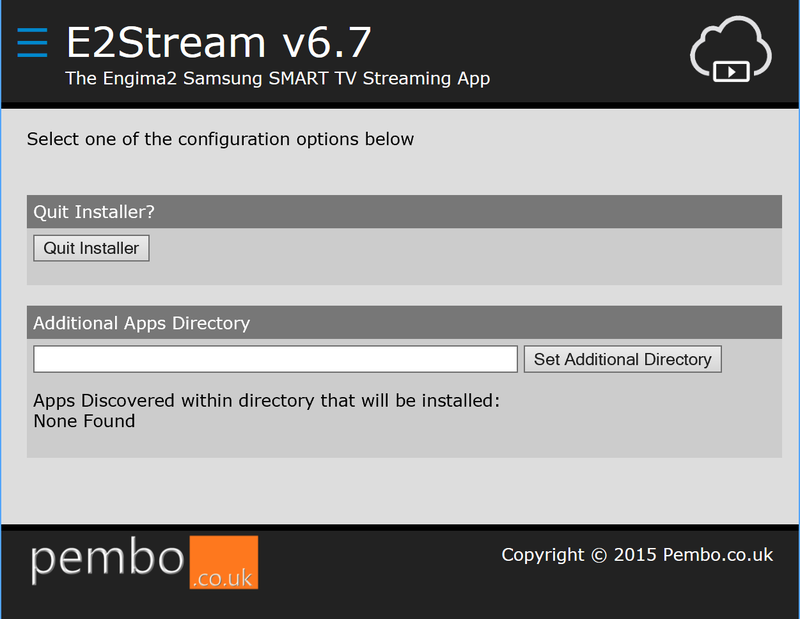 An edited copy of this – to protect some personal details is shown below. Holiday Village Lanzarote, a 2 Bedroom Suite, with Garden View, Private Pool and Terrace. We’d been to Holiday Villages previously – the kids loved it, and its got a private pool and a 2 bedroom suite – bang on requirements. Job done, worth getting up early to book, and left us feeling very smug we’d done this. Paid a low deposit of just £200. This was April the 5th. Doesn’t take an IQ of Stephen Hawkins level to notice the difference – the private pool had become a jacuzzi. A pool is also a swimming pool. Yes, a jacuzzi would be great without kids being honest with everyone, but on a kids holiday, a swimming pool was what we wanted, what we reserved, and what we expected. So… is it a pool or a jacuzzi. I got a response immediately asking to DM my booking reference, which I did straight away (early morning). At the end of the working day, no response whatsoever, so rather than hanging around for a response – I wanted to get this sorted, I called up the call centre. This is where it starts to get ridiculous unfortunately. Me: This is my reference number. 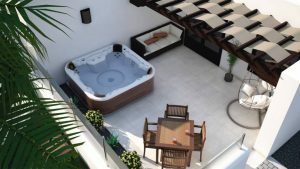 I’ve booked a hotel a few weeks back, booked a private pool, now its showing as a jacuzzi can you tell me whats going on. Call Centre: I’ve looked in my system, I can see that on April 5th you booked a room with a jacuzzi. Me: Don’t be ridiculous, I told you, I booked a private pool, I’ve had a confirmation letter stating this, and I’ve got a copy of the confirmation from when I booked. Call Centre: No, the system says you booked a room with a jacuzzi. I called the call centre tonight to discuss and was accused of lying. 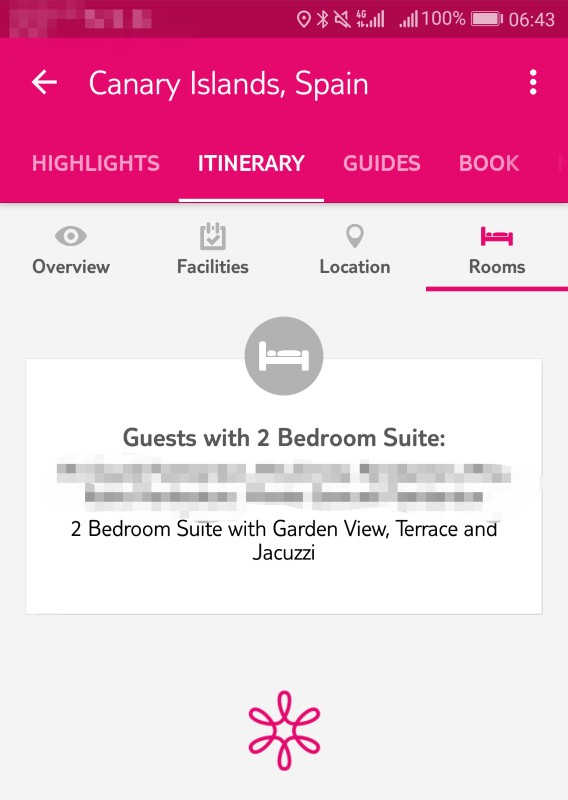 Told it was on the system I’d booked a Jacuzzi room. Absolutely livid about this now! Asked to send proof, was told first choice don’t respond on twitter. Whoooaaa. Hold on a minute. Private pool or private Jacuzzi, they are very different. And if it is a pool, why is it now showing as a Jacuzzi. So… in summary where am I left, is it a pool, or a Jacuzzi. At this point, I’ve given in with direct messaging, and any messages on this on twitter are all public now, and I’m not calling the call centre again to be called a liar, so I asked for a direct contact number for someone to address this. I’ve got a reply reasonably quickly with a contact number for the change team, and I called it when I next got the chance – This was Wednesday 2nd May. I called up the change team on the number provided. For the very first time I saw some light, only to have it quashed pretty quickly. Change team: Hi, we need to contact the product team, this might have been a miss sell, but we need them to confirm. I’ll email them and it may take up to a week to respond. Me: Ok (sad tone / lost the will to live). And that brings us to today… no contact from the change team yet – but I will be chasing tomorrow… the longer this gets drawn out, the less chance of getting a room style I want! And one more thing… here’s the printed brochure room description! I called the programme change team today to see if there was any update. There was although they hadn’t called/informed me. 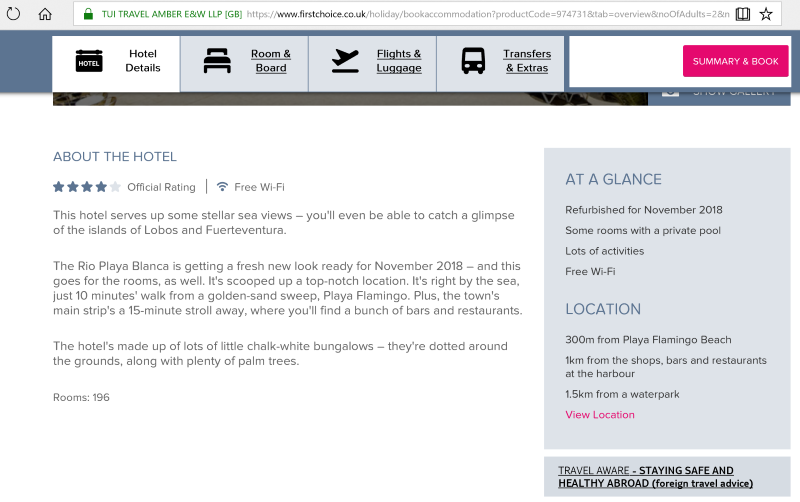 It seems that the hotel isn’t going to build private pools and that somewhere someone has misunderstood/mis-sold this. The product team are discussing with the hotel, and there’s hopefully an update middle of next week. 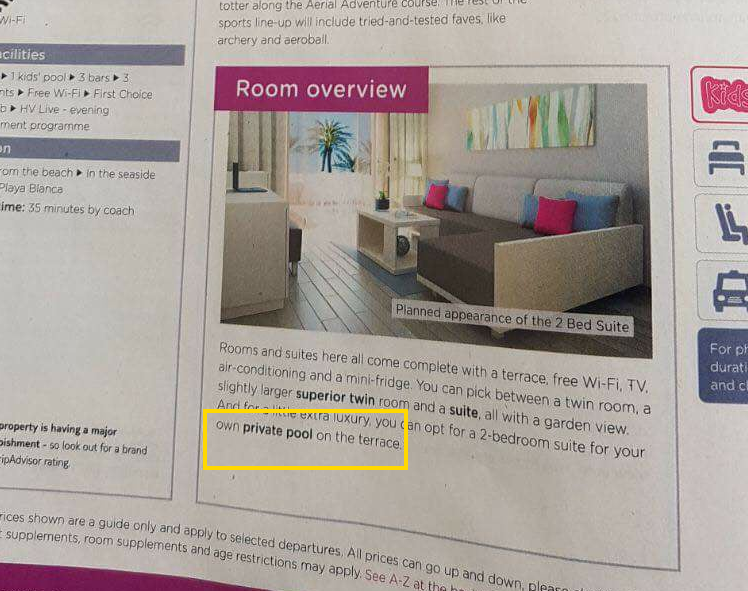 The reality is (as i’d already figured), there isn’t likely to be an private pools – first choice/tui already know this as the description has change to a Jacuzzi, but no one yet wants to really admit it. I asked about getting my deposit back – I was told this was not possible despite this being against package travel regulations (https://www.which.co.uk/consumer-rights/regulation/package-travel-regulations) covered in regulation 4, 5 and 12/13, so there’s definitely legal grounds here I could exercise if needed. I also mentioned that my deposit is due shortly, and there’s no way I’m going to be paying any more money until this is sorted one way or another, and again reiterated that I did not appreciate being accused of lying when I called on Monday night. Guess what – conveniently, there is no record of my call on Monday night. The reality is, the longer this takes, the less likely I’ll be able to find a room/holiday I want. This was the reason we booked early. I’m giving them till 9th May where I’ll call back and this will be escalated if there’s no resolution. cancel your holiday with us and receive a full refund of all monies paid. Of course – technically, this isn’t relevant yet, as I’ve still not had any official notice that my holiday has changed, either via email or text, despite what I’ve discovered/been told. Been browsing again today – seems the holidays we looked at to swap are going thick and fast whilst TUI/First Choice procrastinate over what to do in relation to this. Child free places are disappearing, and the room choices dwindling…. surprise surprise (and not in a good Cilla (now Holly way!). 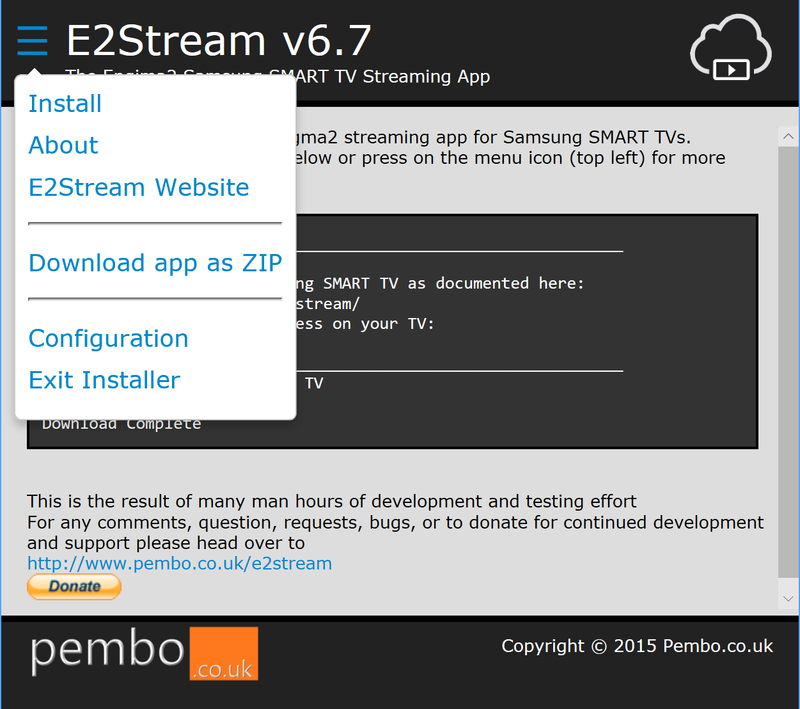 Check out the AT A GLANCE section in the screen shot above taken at the update time I mentioned. (or is that a Jacuzzi). Clock is ticking – 1 whole day left tomorrow, before I expect a resolution to this on Wednesday. TUI – you’re running out of time to make this right. Called today and finally had it confirmed once and for all that the private pool has now become a Jacuzzi (quell surprise). Very pleasant phone conversation. We’re going to figure out what we might want to swap to tonight – looking for a like for like/similar swap as per the T&Cs of booking, and will be calling tomorrow to discuss/debate. I’m not in a good mood about this still, having being called a liar and given the run about on this. Lets hope the good customer service continues and I’ll report back on the final resolution of this story tomorrow! Called to discuss the swap, asked for some prices and was told they go away to get them and call me back in 15 minutes…. and nothing since. I didn’t call back as I wanted to sit it out and see how long it would take them to get back to me, well, we’re now more than 15 hours. I’m not sure I can sit it out for 15 weeks, so I’ll be calling back again today. I can cancel today and LOSE MY DEPOSIT – Seriously! I’ve been given so much incorrect information both on the phone, and on twitter its not funny anymore. They blame the hotel, said it’s beyond their control, I repeated time and time, my contract is a package one with TUI, not with the hotel and they are accountable as per the package travel regulations. They love to email, each other but never speak. There’s nobody to complain to other than an email address. Worse still, as I’ve only paid a low deposit, I have to pay the remainder at the end of this month, otherwise they’ll cancel and keep my deposit apparently. Sounds like there’s something legally wrong and immoral here. So, in summary – I have to pay more money, to be able to cancel. 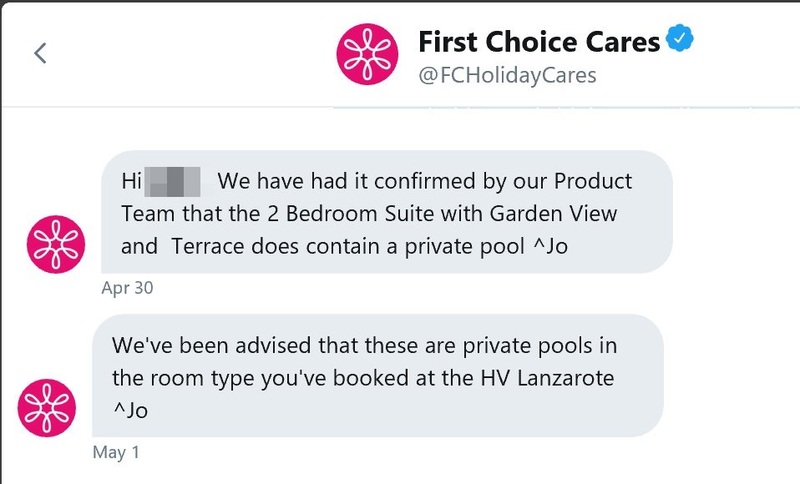 The private pool has changed to a jacuuzi as has been confirmed on the phone and the booking online, but they’ve still not sent me written confirmation! I can neither change or cancel without paying more money…. I’ve escalated – but I’ve got to wait over 48Hrs for a call back, that’s assuming they even bother to. So now – my money is being held to ransom…. nice company! I should credit one lovely lady from a store when I tried calling complaints (got diverted to the standard call centre). She was the most helpful person I’ve spoken to at TUI without doubt. Even referenced an email on the situation, but was powerless to do anything. Much like me seemingly. You do not have to pay for an enforced upgrade. The PTRs say the tour operator is responsible for the hotel owner’s actions, so they have to make suitable alternative arrangements for the continuation of the package. Any changes should be at no extra cost to the holidaymaker. So if the only alternative accommodation is more expensive, the tour operator will have to pay. On the phone today, TUI we not taking responsibility and blaming the hotel. Repeatedly I told them my contract is with them, not the hotel, and it’s not an issue for me what the hotel does, it’s an issue for them, and that’s where my contract lies – seems they are more than happy to flout regulations when it suits. I’ll be interested to see what alternatives are on offer. They have to be like for like…. and at no extra cost. Good luck TUI! Once this sorry episode is over, my money will go to other package holiday companies who really do care about their customer. Seems TUI have messed up more people – the about to be opening in a week or so Holiday Village Montenegro has now been delayed until the 8th June. Reports on social media are of people getting a similar reaction to my calls, being told there’s no issue, being told there’s no suitable alternative, therefore they need to cancel or are being charged to swap for an ‘upgrade’. Total breach of package travel regulations. ABTA, BBC Watchdog, (Shoud be a Sir!) Martin Lewis, or somebody really needs to step in and investigate TUI… there’s too many common reports for these incidents to be a one off. #Speechless. I really feel for those who’ve booked the Montenegro hotel and are now going to go through this pain. I’m sure the elusive ‘head office’ who aren’t allowed human contact are working on it 🙄 . Of course – any hotels / airport parking / transport etc you’ve booked that is now probably not needed… well apparently you’re on your own according to the many messages. Just make sure you’re aware of the T&Cs… you’re entitled to compensation from TUI: https://www.tui.co.uk/destinations/booking/tandc?ptype=PD and don’t forget your travel insurance as the menial compensation might not cover your costs. So my complaint/request was escalated on Friday 11th. I was promised a response with 48hrs. I assumed that to be 2 business days, and it was confirmed on the phone I should expect a response Today. I don’t think it will surprise anyone then that I’ve not had any response full stop, and having called the programme change team at 17:15 tonight to ask why, not getting through, and having my call cut off at 17:40 because the office was now closed, my humour and good will (what little I have left) is all but expired. It’s time to write a formal letter / email I think. 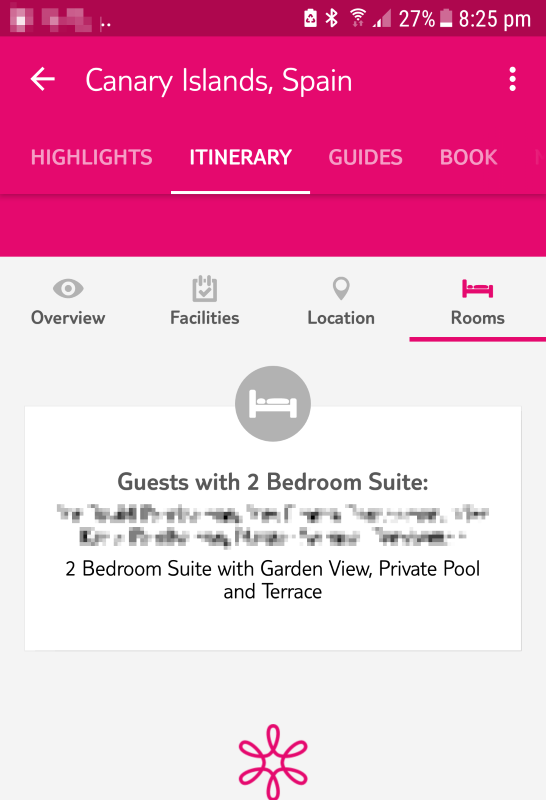 As a slap in the face, the First Choice TUI website has now been changed to include renders of the room. Its a jacuzzi, and I’m sure as hell I didn’t book a jacuzzi. As nice as the rooms look, it’s not what I wanted, and not what I was sold! Yet my deposit is still being held to ransom – what the hell TUI!? Finally, after over two weeks of constant chasing, phone calls, twitter messages and more, TUI have finally agreed that it is a major change, and have allowed me to cancel without losing a deposit. Had you done this much more quickly, not accused me of lying, not gave me the wrong information consistently, and had it not been such a terrible customer experience, you’d have kept a long time customer. As it is, it’s going to take some time before I can forgive the terrible customer service and experience, and therefore for the foreseeable future, my money will be going elsewhere! You can cross your T’s and dot your i’s all you like, but you never put the customer in the middle, never admitted your failings, and worse still, were in complete breach of package travel regulations, and in my eyes you are an absolute disgrace and an example of how not to do customer service. Lets just dissect exactly that this says. On the 5th of April the room type says 2 Bedroom Suite with Garden View, Terrace and Jacuzzi. Well… I guess that infers I must be lying again… or is it yet another exhibition of extremely poor customer service I wonder! 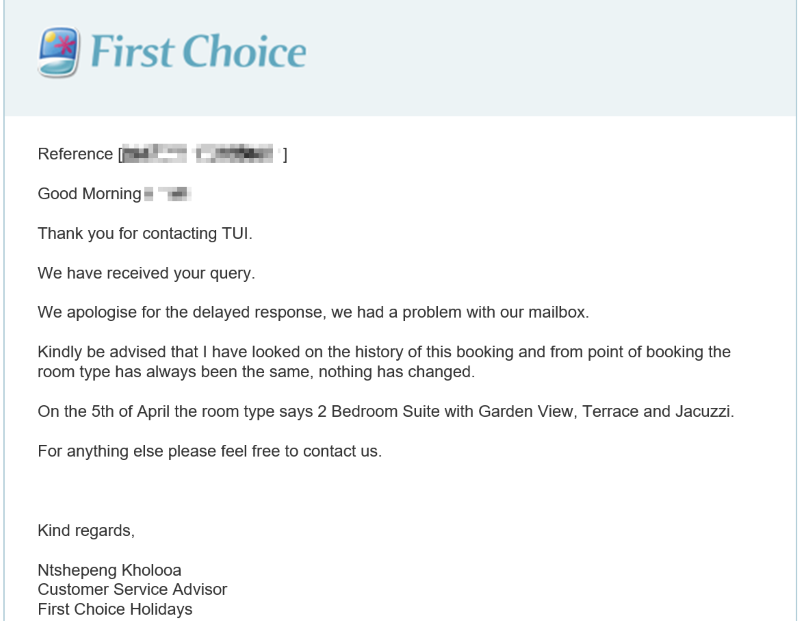 A response that is factually incorrect, Accuses me of not telling the whole truth, and more so, arrives 8 days (repeat 8 days) after I’d actually managed to cancel the holiday because I was MISS-SOLD a room that won’t/doesn’t exist. Clearly this was looked into deeply, oh… wait! Well TUI/First Choice, It won’t surprise you to know that I’ve rebooked my 2019 holiday, decided to book one of higher value, and it’s not with you. Thank you for showing me that there are better compaines out there who value their customers.